Brian Youngers is looking to hire an A&P for his rural Kansas company and expects it to be a challenge. Youngers, operations director for Southwind Global Aviation, an aircraft delivery and services company, thinks Southwind’s rural location—42 miles north of Wichita—and an industry-wide shortage of mechanics could make filling the vacancy tough. “I do think we’re going to have a hard time finding someone,” Youngers told AIN. When he called in mid-January to post Southwind’s job opening at schools in Kansas that train A&Ps, he was told by one that nearly all of its graduating students had already found employment. “We’ve got to get in there now if we even want to have a shot,” Youngers said. His experience is a familiar one to MRO owners, directors, and aircraft manufacturers across the country. With a 3.9 percent U.S. unemployment rate and a strong economy, finding qualified talent is difficult for a lot of industries. But for aviation, the mechanic pool is only expected to get tighter as 30 percent of them are at or near retirement age, according to the Aviation Technician Education Council’s December 2018 Pipeline Report. The report also projects the aircraft mechanic population will shrink 5 percent in the next 15 years. What’s more, in its 20-year Technician Outlook published in October 2018, Boeing projected North America alone will need 189,000 new technicians by 2037 (120,000 in commercial aviation; 55,000 in business aviation; and 14,000 in civil helicopters). Worldwide, Boeing’s projections said the industry will need 2.43 million new technicians in the next two decades (622,000 commercial; 89,000 business; and 43,000 helicopter). The shortage didn’t happen overnight and it likely won’t be quickly solved, industry officials said. 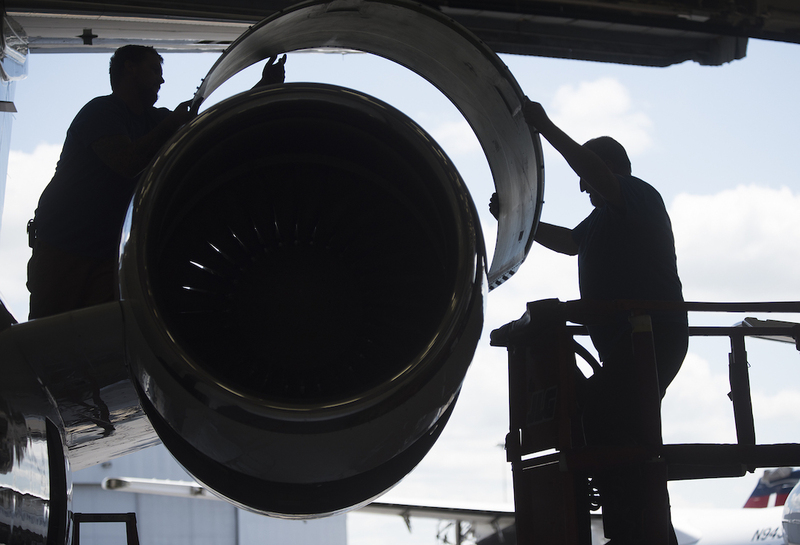 It’s a function of a rash of anticipated retirements, increased demand for aircraft maintenance, competition from outside the industry, and a broader lack of awareness of the need for mechanics outside of aviation, they said. According to ATEC, the shortage is not a training capacity issue. In its report, ATEC said only one of every two seats available is filled in a technical school offering A&P training. That means even without expansion, there’s capacity for 17,000 additional students. ATEC executive director Crystal Maguire said that schools are increasing their recruiting activities and expect enrollment to increase. “But there is still significant opportunity for industry employers to help define career paths and attract more students into the pipeline—students that they will need as technicians in the coming years,” she said. For officials on the frontlines of the shortage, most said they are fighting every day to attract and retain mechanics. “I would say we continue to struggle to fill our A&P jobs,” Maggie Topping, Textron Aviation senior v-p of human resources and communications, told AIN. “We hire them on a global basis, so yes, absolutely there’s a shortage.” The biggest struggle for the Wichita-based Cessna and Beechcraft airframer is competition from commercial airlines, Topping said, as well as companies outside the aviation industry such as amusement parks, wind farms, utility companies, and heavy machinery manufacturers and dealers. “With an A&P license, you can work in a multitude of industries, so then we compete on that, and then (applicants) have to decide on us versus United or us versus Delta,” she said. C&L Aerospace’s Phil Miholovich told AIN he once attended an aviation job fair where one of the recruiting companies was Bobcat, a construction equipment manufacturer. “Some of these other industries can afford to pay more by the nature of what they do,” said Miholovich, director of maintenance for Bangor, Maine-based C&L. The ATEC report said of the students graduating from A&P programs participating in its survey, 13 percent took a job outside aviation. ATEC said that’s down from 25 percent in 2015 and 2016, and 20 percent in 2017. But competition from outside the industry remains a concern for MRO companies. “This industry could be better” in terms of compensation, Jim Hansen, owner of Western Jet Aviation in Van Nuys, California, told AIN. Hansen, whose company employs about 40 A&Ps, said he can recall a time not too long ago when an aircraft mechanic could “get a job at a local garage paying pretty good” wages. Hansen said this year Western Jet has been able to raise its pay at or above market rate for mechanics. “We have also put more money in their pockets through health benefits,” he said, by Western Jet taking on more of the costs of employee health insurance. ATEC said that schools responding to its survey reported an average starting hourly wage of $19.70, up 40 cents an hour from its 2017 survey. According to the Bureau of Labor Statistics, the median hourly wage for aircraft mechanics and service technicians was $29.34, based on its latest data from May 2017. Miholovich and others think there are ways to increase the ranks of A&Ps. One of those is through apprenticeships, which C&L started about four years ago. So far, Miholovich said the company has trained 20 of its A&Ps that way. The attraction, he said, is the company is paying them to learn the trade. “We’re basically hiring kids who have mechanical aptitude and are willing to learn,” Miholovich said. “That’s proven to be quite successful.” But the downside is a company has to have the resources to be able to train and pay someone with no experience, he said. It also has to have experienced A&Ps willing to mentor apprentices, Miholovich added. That awareness, said Textron’s Topping, begins at the high school level. “It’s a volume game of how many can we attract and retain, because it’s very competitive. I think that’s why we need to work on the high schools.” That’s just what Textron is doing. In May 2018, Textron along with Wichita Public Schools and Wichita State University Tech unveiled a program called Aviation Pathways, which is being piloted by four Wichita high schools with plans to expand it across Kansas. The aim of the program is to promote skilled careers in aviation to high school students. It takes it a step further from mere promotion by allowing students to take classes at WSU Tech that can satisfy their high school graduation requirements, while also receiving training in an aviation manufacturing trade or as an aircraft mechanic. Topping said for those students pursuing an A&P, Aviation Pathways won’t give them all the courses in high school that they need to complete their training, but it gives them a big head start. “It accelerates their path,” she said.